Prior to WCF, different communication technologies such as ASP.NET Web Services, .NET Remoting, and ASP.NET’s Web Service Enhancements (reliability, platform independent security, and atomic transactions) have been used. DCOM which is used by .NET Enterprise Services with its automatic transaction support is even faster than .NET Remoting. Windows Communication Foundation (WCF) introduced by .NET 3.0 which includes all the features from these predecessors and combines them into one programming model. Hosting for components and services – WCF can be hosted in the ASP.NET runtime, a Windows service, a COM+ process, or a Windows Forms application. Address: is the location where the service can be accessed. The client needs a compatible endpoint to access the service. The client invokes a method on the proxy. The proxy offers methods as defined by the service but converts the method call to a message and transfers the message to the channel. The channel has a client-side part and a server-side part that communicate across a networking protocol. From the channel, the message is passed to the dispatcher, which converts the message to a method call invoked with the service. SOAP, A platform-independent protocol that is the foundation of several web service specifications to support security, transactions, reliability. Web Services Description Language (WSDL), Offers metadata to describe a service. Representational State Transfer (REST), Used with RESTful Web services to communicate across HTTP. Data contract, the data contract defines the data received by and returned from the service. The classes used for sending and receiving messages have data contract attributes associated with them. Service contract, the service contract is used to define the WSDL that describes the service. This contract is defined with interfaces or classes. Operation contract, the operation contract defines the operation of the service and is defined within the service contract. Message contract, if complete control over the SOAP message is needed, a message contract can specify what data should go into the SOAP header and what belongs in the SOAP body. Fault contract, the fault contract defines the error messages that are sent to the client. Specifies the internal execution behavior of a service contract implementation. Apply the ServiceBehaviorAttribute attribute to a service implementation to specify service-wide execution behavior. (To specify execution behavior at the method level, use the OperationBehaviorAttribute attribute.) This attribute can be applied only to service implementations. Bindings are objects that are used to specify the communication details that are required to connect to the endpoint of a Windows Communication Foundation (WCF) service. Each endpoint in a WCF service requires a binding to be well-specified. Protocols – Determines the security mechanism being used: either reliable messaging capability or transaction context flow settings. Encoding – Determines the message encoding (for example, text or binary). Depending on the binding, different features are supported. The bindings starting with WS are platform independent, supporting web services specifications. Bindings that start with the name Net use binary formatting for high-performance communication between .NET applications. WCF can be host in Windows service, a COM+ application, WAS (Windows Activation Services) or IIS, a Windows application, or just a simple console application. When creating a custom host with Windows Forms or WPF, you can easily create a peer-to-peer solution. Studio Add Service Reference, this utility creates a proxy class from the metadata of the service. ServiceModel Metadata Utility tool (Svcutil.exe), you can create a proxy class with the Svcutil utility. This utility reads metadata from the service to create the proxy class. 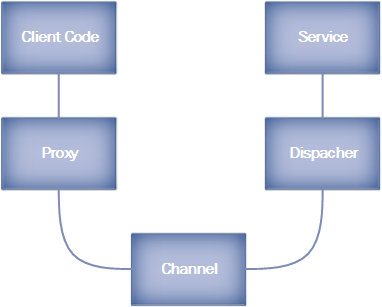 ChannelFactory class, this class is used by the proxy generated from Svcutil; however, it can also be used to create a proxy programmatically.